Land managers in the West seek to efficiently monitor their forests and rangelands, particularly after wildfire. ForWarn's high frequency record of the Normalized Difference Vegetation Index (NDVI) provides a coarse filter means to accomplish this using two measures. First, the mean NDVI varies with vegetation composition and density such that bare ground has a low NDVI, grass is higher, shrubs and open forest stands are higher still, and dense forests are highest. Second, variation in the shape of the annual NDVI curve provides insights into the phenology of the dominant vegetation types that are present. The power of these tools is well-illustrated in the Eagle Lake District of Lassen National Forest north of Susanville, California--a complex volcanic landscape that is prone to wildfire. 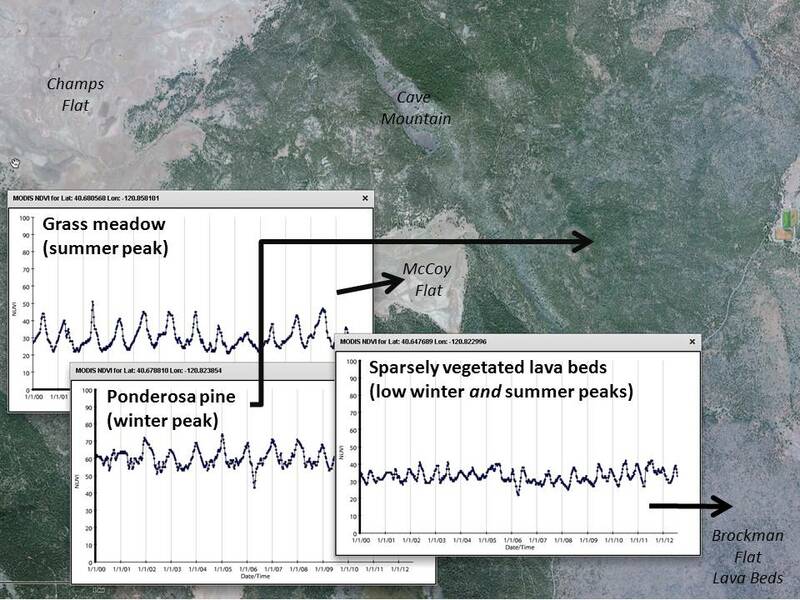 The ponderosa and Jeffrey pine dominated forests tend to peak in winter--a phenomenon that is typical of this portion of the West, while grass and herbaceous dominated meadows exhibit a lower mean NDVI that peaks in summer. Nearby rocky lava fields exhibit a lower, but bimodal pattern, and this suggests the presence of scattered grass, evergreen shrubs and the occasional pine tree. Such insights can be used to coarsely monitor the relative density and composition of vegetation years to decades after disturbance.